I remember watching the original Tron (1982) with my family when I was a kid and loving every minute of it. At the time, it was a fresh idea, something new. It wasn't a huge hit, but its sequel is bound to be. The story begins when Kevin Flynn (Jeff Bridges) gets sucked into a computer, where, to survive, he has to do battle in video-game-like fashion. Close to 30 years later Flynn's legacy unravels a new chapter, told through his now much older son, Sam (played by up and coming star, Garrett Hedlund). 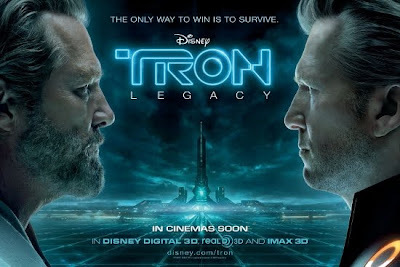 TRON: Legacy is essentially the same story, but with vastly updated and improved graphics/special eff ects. Kevin Flynn's (Bridges) whereabouts have been unknown for the past 20 years and once again, tech giant Encom is being run by shameless exploiters. Sam eventually finds himself at his dad's old video game hub where he is sucked into the computer world his dad designed, who has, of course, been trapped in his creation all the while. Kevin has been pushed out of power by his own creation, Clu (Bridges yet again), and lives in retreat as a sort of Zen master. The reunited father and son join forces in order to escape and from there the story takes digital flight. The entire movie looks and feels incredible. 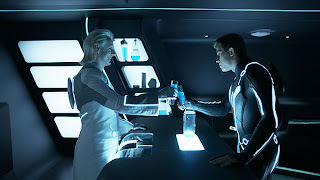 I was completely immersed in the legacy that is Tron. We have our CG friends to thank for that. And after a whole year of movies that squandered the potential of 3-D, this movie actually uses it to its fullest. Make no mistake, it's definitely a movie you want to experience in 3-D fashion. Everything was so beautiful and visually striking and at times even breathtaking. The graphics were off the charts. [I will say, though, I was hoping Clu (Kevin's creation) would look more realistic. Obviously he needs to look just like Bridges back in '82, but the weak CG was a tad distracting.] Daft Punk did an outstanding job with their all-consuming score as well. It's definitely something I want to own. Bridges and Hedlund make a believable father-son duo, and they get great support from the lovely Olivia Wilde as a naive computer program who lives with Kevin. And what a pleasant surprise to see Michael Sheen turn up playing a brilliantly loopy yet twisted rogue who looks like a digital Jack Frost and acts like a corky man iac on death row. The whole point of a sequel (aside from making more money) is to carry on the story by bringing something new to the table, while staying consistant to the original - Tron: Legacy did just that. The story does a wonderful job reeling you in the for the hook, but half way through you're unfortunately left dangling with nothing to do. While the action sequences are indeed exciting and even thrilling, they quickly dwindle to a slow and steady stop. My only real complaint is that the ending was a little weak and unsatisfying, not nearly enough of a payoff for what came before. I wanted this grand finale, but instead I was left wanting. 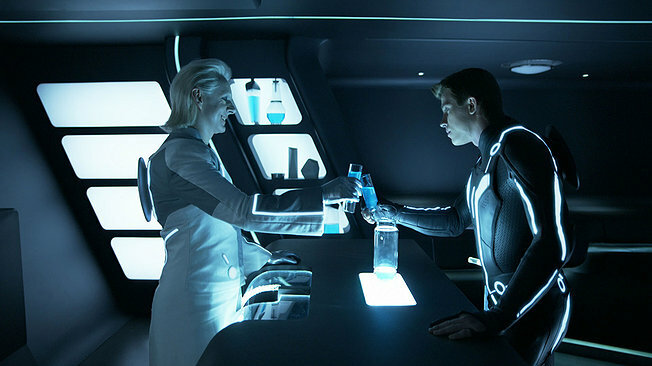 All in all, Tron: Legacy is a movie of sci-fi epic proportions for the digital age. It's fun and exciting, and despite the anti-climatic ending, you will definitely be wowed and entertained.